DOCET LECTOR STEREO LINE LEVEL TUBE PREAMPLIFIER MODEL : M.L.A. The M.L.A. 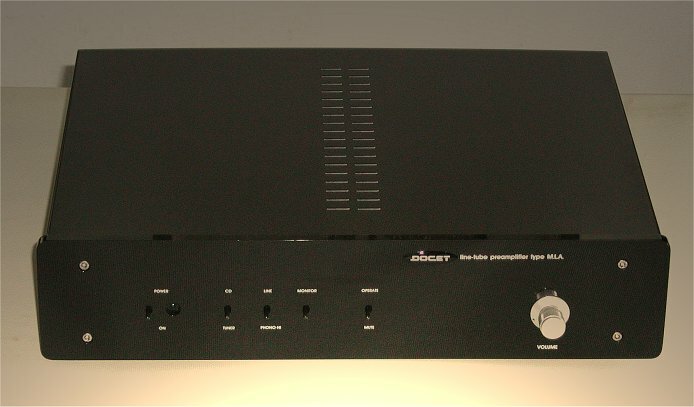 is the first line dedicated preamplifier with exclusive circuity called S.A.T.C. . This special circuity patented by Lector permit to install any type of double triode directly on circuity. So now you can use your preferred tube selection without to change the preamplifier, it's drive this tube: ECC 88-ECC 82-6BK7-6CG7-and many others. From factory we supply the MLA with ECC 82 but after the Customer in future can change the pair of tube with any other double triode at 12 volts or 6 volts filaments. Many analogies are very near to the VP 04 but the MLA offer better performance in sound and music reproduction. Discovery the hi-value sound of MLA and if you need a completly phono MM or MC stage use our PHONO LINE PRODUCTS so you can have a completly pure class A outstanding preamplifier system.